Guest Article: What is the Dark Place and its inhabitant the Dark Presence? Recently we concluded our writing competition; the author of the winning piece was April who looked into the representation and symbolism of the Dark Place, and possible repeating historical patterns. She's also incredibly talented at special effects make up; some of you may have seen her traumatising injury make-up work at the Remedy forums. 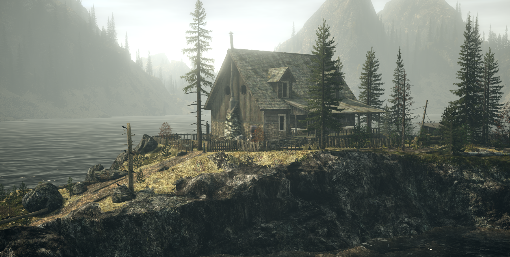 It's probably a question that a lot of Alan Wake fans have theorized on, and while we've been given subtle hints along the way, we're ultimately still left in the dark. Is the Dark Place another dimension, or does it merely reside in the deepest part of ones subconscious? Perhaps the answer is both. I speculate that something does lurk beneath the depths of Cauldron Lake, but it has no true form because it is the Dark itself. It lingers beneath Bird Leg Cabin waiting for someone to bring it out from the abyss, and when some unfortunate person does approach, it is thus able to manifest itself in a number of ways once it gets a good look inside your mind. While it has the ability to take host of a body- a poor Barbara Jagger, "The Darkness wears her face"- it also has the capability to bring your worst fears to reality. Take Alice Wake's fear of the dark as an example of how it can manifest. Jagger, now taken over by the Dark Presence, lures the Wake's to the cabin and not only kidnaps Alice, but possesses Alan to write a way for the Dark entity to be freed. It has Alan create a horror story because, in essence, it lives off of fear and feeds from his thoughts. Alice is crippled by the dark, Alan is struggling to write another novel, it manipulated them in order for one thing; to get what it wanted. While it's able to reside in Jagger's body, it is still too weak to spread its evil passed Bright Falls, and therefore uses artists as a means to grow stronger. The Dark Presence knows that creativity is power; and therefore wills its way into the minds of those so eager to create. The extended reach of the Dark Presence; its trap in the "real world". But Alan was aware enough to know what was happening and escaped. The Dark Presence, now having read the minds of both the Wake's, is determined to get Alan back and, more powerful than before, spreads its evil through the dark, since that's how the story was created. And while Alice is more affected by the dark than Alan, he was afraid of the dark as a child. But the Dark Presence knows that his goals and his fears are the same and the most troublesome thoughts in his head. It knew how to play him, especially in the DLCs, where it's apparent that the Dark Presence has a stronger hold on his mind while inside the Dark Place. Though the Wake's shared fear of the dark was able to physically absorb into the shadows and create Taken, only Alan's struggle to write was mentally haunting him. Which leads us to the events of American Nightmare. Was that just a figment of Alan's mind while still trapped in the Dark Place, or had the Dark Presence seeped out into the real world and left its mark on a small Arizona town with other residents? Again, we don't know for sure, but I believe it's the former. The most concerning of this event is that of Alan's doppleganger Mr. Scratch. His original purpose is vague- replace Alan while he's gone so his friends don't realize he's missing- and somewhere along the way, probably close to Alan's initial disappearance, Mr. Scratch abandoned his mission because he was just having too much fun. Or that was his plan from the start. This leads me to believe that, while Alan and Mr. Scratch are two completely different personalities, they in fact share the same body. The only time they are ever seen together is in the town of Night Springs (A town named after a show Alan worked on) and prior to that, the Dark Place. I've also come to theorize that Mr. Scratch may just be another manifestation altogether. He is literally Alan's negative; a fear of himself. And fear plays a prominent role in the Dark Presence's charades. So, was Mr. Scratch really out there in the real world tormenting Alice and the fans, or was he trapped alongside Alan because he was just a mere figment brought on by the Dark Place? And if Alan had lost, would Mr. Scratch be freed and sent out in Alan's body to spread the Darkness? I believe so. Perhaps these same internal struggles could've been said for Barbara Jagger.